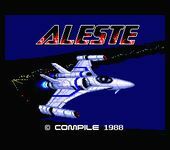 Aleste (アレスタ) is the first game in the Aleste series of shoot 'em up video games. Developed by the Japanese developer Compile and released in 1988, it has been seen on the MSX and Sega Master System. The story of Aleste deals about the human-made Supercomputer, DIA 51, which has been infected by a hybrid virus and is spreading like wildfire, making it decide to eliminate the human race. When Yuri, Ray's girlfriend, gets injured in DIA's assault, Raymond Waizen has all the reasons in the world to get rid of DIA 51 once and for all in his Aleste fighter. Source: Wikipedia, "Aleste," available under the CC-BY-SA License.